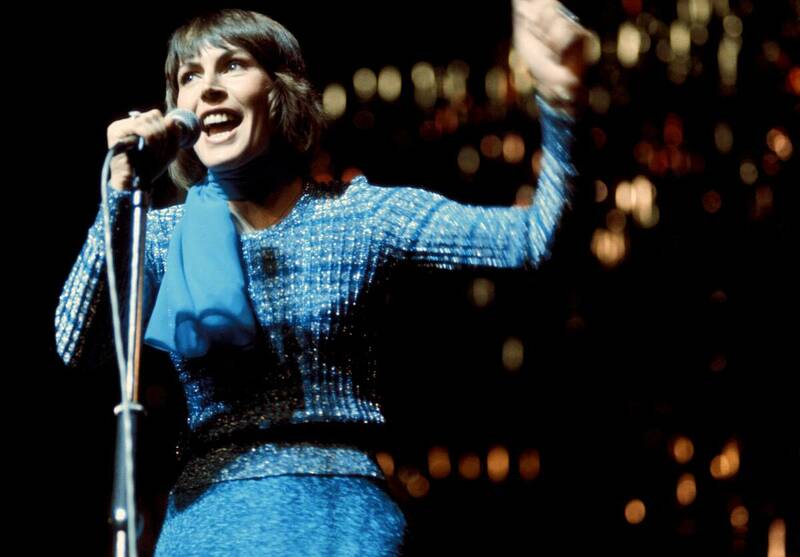 You're Gonna Hear Them Roar: 'I Am Woman' Is An Anthem Beyond Its Era Helen Reddy's 1972 single captured the spirit of second-wave feminism. Today, its echoes still sound in American culture — including a version that arrived just in time for #MeToo. "I Am Woman" singer Helen Reddy performs in 1970. One of the best-known anthems of second-wave American feminism might not have become a No. 1 hit without an obnoxious display of macho behavior. In 1970, singer Helen Reddy's manager and then-husband, Jeff Wald, met with an executive at her label to discuss a song she hoped to record with the label. It was called "I Am Woman." "Capitol Records said, 'That women's lib crap is gonna kill her,' " Wald remembers. " 'Why are you letting your wife do this stuff?' "
"So I jumped up on his desk," Wald says, "and I peed on it. And the cocaine had nothing to do with that behavior." Reddy herself now has dementia and was unable to be interviewed for this story. But she told Houston Public Media in 2014 that "I Am Woman" was delivered from heaven. "It came to me and it wouldn't leave me," she said. "It was simply a phrase that — over and over, 'I am strong, I am invincible, I am woman.' And I thought, well, this has to be a song." After Reddy penned the lyrics, songwriter Ray Burton came up with the tune. Wald took "I Am Woman" to a small radio station in the suburbs of Washington, D.C. — chosen because it was filled with secretaries and other independent women working pink-collar government jobs. Soon, Wald says, the station's phone was swamped with requests to hear a song that spoke to women at that moment. "Market by market, we were working that record, you know?" he said. "Just one market at a time." "It was so hard," Reddy recalled in 2014. "So hard. You know, so many radio stations would say, 'Well, we're already playing a female record.' "
It took nearly a year for "I Am Woman" to work its way to the top of the charts. After it become a No. 1 hit in December 1972, Reddy won a Grammy for best female performance. She thanked Wald, "because he makes my success possible." And then, God: "Because she makes everything possible." Referring to God as a woman on national television in 1972 was an audacious move. But it rang true in the same year that the Equal Rights Amendment passed the Senate and Shirley Chisholm ran for president. The Supreme Court decided Roe v. Wade just a month after "I Am Woman" reached No. 1. "It really resonated for a lot of people," says Nadine Hubbs, a professor of musicology at the University of Michigan. "She was putting into words some really important social changes that were going on at the moment." About a year ago, the band Pink Martini also started performing "I Am Woman." Lead singer China Forbes was not crazy about the song at first — it felt a little dated. But she says she'll never forget the first time the band performed it. "All these women came rushing up to the stage. And it was hundreds and hundreds of women," she says. "And we all sang 'I Am Woman' together. It was so incredibly powerful that I went from being slightly dubious about singing 'I Am Woman' to addicted to singing the song. "It's so wonderful that a song like that exists, because it's so galvanizing and empowering that the cheesiness goes away and you're just left with this incredible feeling." Forbes' bandmate Storm Large believes audiences reacted so strongly for a reason. Pink Martini started performing "I Am Woman" right around the beginning of the #MeToo movement. "Boy, is this song timely," she reflects. "It's got a lot of hope to it. And God knows, we need a lot of positivity and some optimism." These days, the singers say, "I Am Woman" is not just for women. They've recently invited men and women onstage to sing this equal rights anthem together. The dudes get into it: "I'm very proud of our sausage Americans," Large says. In 2018, she suggests, "I Am Woman" might just be a battle cry for everyone.